Simplicity is a very nice thing. Joshua Morgan and Brad Scoggins think so too, which is why they started a skin care company of their own, called Little Barn Apothecary. It's built on the philosophy of combining pure, simple ingredients, or as Joshua sums it up, "We do more with less." Their premiere collection is an impressive one and includes soaks, salves, scrubs and oils. Joshua, "When we think of the South, we think farmers, fields and gardens. We take our inspiration directly from the earth and the South holds a pure, unadulterated palette of organic raw ingredients right in our own backyard." 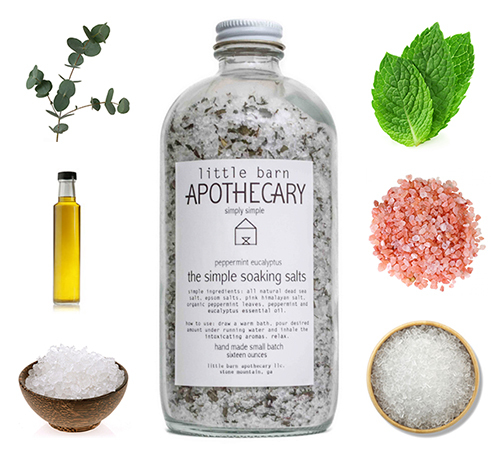 When I asked the boys (who are based in Stone Mountain, Georgia) which products they'd recommend for a relaxing spa night, they were quick to come up with a plan. First, slather your face with cocoa cardamom rose detox mask, then soak in orange clove bathing milk. Follow up with the body oil and finish with a few drops of the simple, sumptuous face oil. Life partners as well as business partners, Joshua and Brad are a true team. Joshua spent 16 years in the beauty, spa and wellness arena while Brad has extensive expertise in marketing, hospitality and brand management. Joshua, "We literally do it all and we do it all as one. Brad photographs while I create the set and hold the lighting. He stirs, I pour, then he labels..." Ahhh, cuteness overload. I got a hold of a few Little Barn products a couple weeks ago and had a spa night of my own. I began with their Simple Coffee Scrub (fair trade organic coffee beans, real cane sugar, sunflower seed oil, coconut oil, hemp seed oil). The combined oils work to moisturize and soften, are anti-aging, anti-inflammatory and anti-bacterial. I loved the rich smell of coffee and it was a very effective exfoliator. The older I get, the more I like and appreciate these simple, natural ingredients on my skin. Then I tried their Detox Mask (organic cocoa powder, Kansas organic blue cornmeal, ground cardamom seed, rose essential oil). The organic cocoa is full of antioxidants while the cornmeal is another excellent exfoliant. The cardamom is antibacterial and helps improve circulation as the rose essential oil smooths the skin. Plus, the rose aroma strengthens the heart both spiritually and emotionally. I loved it and my skin felt so soft. The added bonus is you need to use very little of this mask (and the scrub) with each use, so the shelf life is excellent. I'm a sucker for a good logo and these guys hit it out of the park. It represents their brand philosphy to a tee. 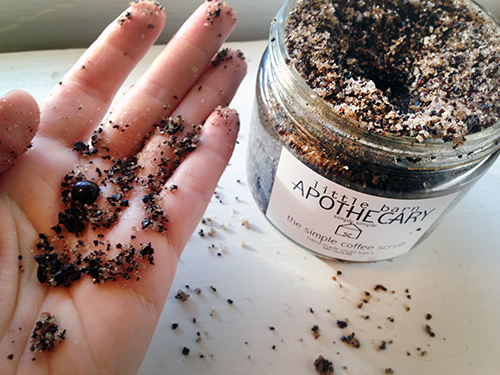 I highly recommend trying a few Little Barn Apothecary products. This impressive little company is less than a year old, with well designed products that incorporate high quality, purposeful ingredients, all bottled with love. It's just that simple.